One thing that threw me for a loop during the early days of my fly fishing journey, was when shop owners encouraged me to pick out a rod and “pretend cast” in the shop. No doubt their intentions were good, “try this one, it’s smooth as silk!” or, “try this one… nothing faster today.” These descriptions were decent, I thought at the time, but nagging questions persisted. Do I even need a superfast rod? Do I want or even like a rod that’s as smooth as silk? Time provided all of the basic answers. Over the course of a few years, I purchased, borrowed and used a variety of fly rods that allowed me to form my own personal vocabulary to describe how a rod behaved on the water. More importantly, time allowed me to understand and identify the things that made a rod right, or wrong – for me. What exactly is fly rod action? 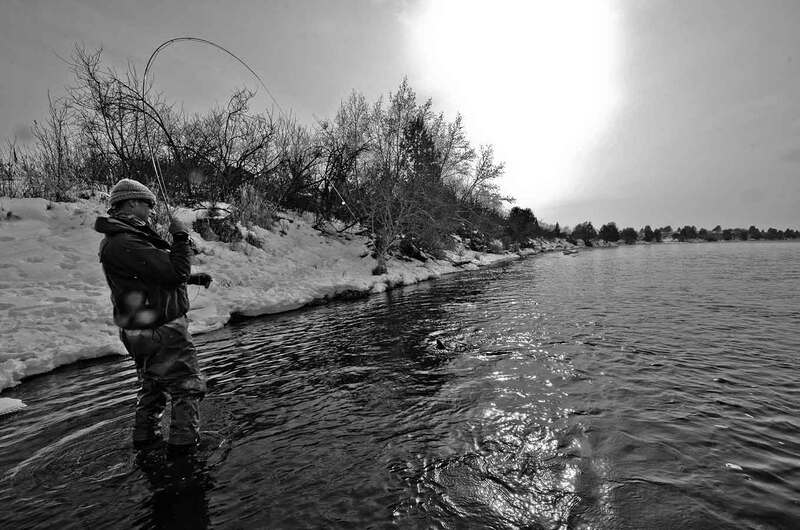 Fly rod manufacturers often describe their rods by designating a type of “action” for each product or product line. Fast, ultra-fast, medium-fast, and moderate are all decent indicators of product capability, but how does an ethereal term such as ultra-fast describe a product’s overall characteristics? In manufacturer catalogs, flex categories have been described as total rod flex, gradual or “tapered” flex, tip flex, arc flex, and moderate arc flex to name just a few. What to make of these terms? Rather than describe a rod’s overall performance, they actually describe a rod’s shape or “look,” as it is taken through the casting stroke. The first thing to keep in mind is that these terms, although used by a majority of rod manufacturers, are all relative. A rod designated as fast by the manufacturer is just that: that one manufacturer’s assessment of that rod. As of yet, rod manufacturers don’t use scientific, standardized terms or measurements to describe—with any amount of accuracy—their wares’ behavioral characteristics. That level of industry-wide standardization just doesn’t exist yet. One manufacturer does offer a numerical flex index, which is somewhat helpful, but only for those who are familiar with that particular manufacturers products. A rod’s true action, as experienced anglers will point out, has more to do with a rod’s feel than merely its flex. What of the rods feel during the cast? Swing weight comes into play, here (how a rods mass is distributed throughout the blank). What of the shape of the rod’s curve during a cast? Is it a smooth, progressive curve? (nearly always the hallmark of a well-balanced trout rod), or does the rod offer some tip flex but remain stiff as a hockey stick the remainder of the way down to the cork handle? Complicating the issue is the question of where to draw the line between fast and ultra-fast. We can start to answer some questions about rod action by examining a rod’s curve during a cast. It is your fishing style that should determine rod action, and not just your casting requirements. Faster rods allow for quicker loading and longer casts. These rods flex less overall, and can incorporate tip sections that vary greatly from manufacturer to manufacturer. The gentler among these rods employ fairly flexible and more sensitive tips. The opposite is true of the more powerful rods. Despite these different physical characteristics, rods can indeed have similar action. Fish two or three rods, all of which are graded as fast, and you will no doubt prefer one over the others. This is due to the difference in the rods’ overall action. The extent of the rod’s curve, or flex, determines how diplomatic or heavy-handed you can be while landing a fish. Generalized example: anglers who prefer delicate presentations are the same ones who prefer moderate action rods. It is fair enough to propose a sensitive tip with a stiff but section when searching for a rod that will take on a wily bonefish, but what action should this rod have, or, more importantly, what action do you want that rod to have? The ideal permit rod is an 9- or 10-weight that is sensitive enough to announce a delicate strike but has enough muscle to handle a highly active and at times extended battle. Casting to bonefish normally requires medium to long range casts and reasonable casting proficiency. Should such a rod be medium-fast? Fast? Ultrafast? The correct answer is: All of the above. You can effectively fish bonefish with any of these rods. A rod’s overall action is what will make the cast, strike detection and ensuing battle, with all of its implied fireworks, more or less of an enjoyable experience. There are many anglers with small-to-large collections of fly rods, some of which go unused. There’s a reason for that. The take-away: current descriptions are decent at best. If you’re new to fly fishing and about to make your first rod purchase, fish a rod—if at all possible—because casting capability is just one (albeit important) part of the equation, but it’s not the factor that determines whether you’ll enjoy using that rod.